Cleverly Solved | Do I have to measure my flue before I buy a Chimney Balloon? Which Chimney Product is best for me? 19 Nov Do I have to measure my flue before I buy a Chimney Balloon? 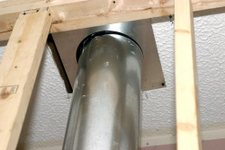 A: RT – When you say you are “relatively sure” of the flue dimension it makes me think you may not have actually measured this area of the flue with a ruler or tape measure. It you have not, I would encourage you to measure it again. You will find that a wooden folding carpenters ruler is very useful to measure up in a flue. Bend the ruler into an L shape and use it as a feeler gauge to reach up and get a measurement of the area you plan to install a Chimney Balloon into. OK, now that you have measured and found your flue to be 32″x14″ as you previously said, then yes a 36″x15″ Chimney Balloon will work just fine. Even though your Chimney Balloon will be a little large, it will function perfectly. As a side note, you can easily install a Chimney Balloon that is no more than 6″ too large in either dimension if your chimney flue area is at least 24″x12″. However, do not buy a Chimney Balloon that is too small for a flue dimension. That is like having a submarine door that is a little too small…it just doesn’t work. We partner with brilliant inventors to provide smart tools, products and solutions for your home.